Jonsbo's C3 Plus chassis features a full aluminium outer casing and a single tempered glass side panel. It supports micro-ATX motherboards allowing for a very attractive compact system. Building on the success of the standard C3 chassis, Jonsbo has taken this opportunity to make significant improvements in this variant. The C3 Plus is ideal as a media server designed for budget-conscious users who do not want to compromise on quality. The changes Jonsbo have made have allowed them to give the C3 Plus extra stability, which includes a high-grade exterior made of 1.5 mm thick aluminium with an extremely sturdy interior featuring 8mm thick SECC steel frame. One of the side panel is solid aluminium where as the other feature tempered glass that give you a glimpse into the internal components. When looking at the interior, the first thing you will notice is the power supply cover. There are also a plethora of hole in the motherboard tray for tidy installation of cables. 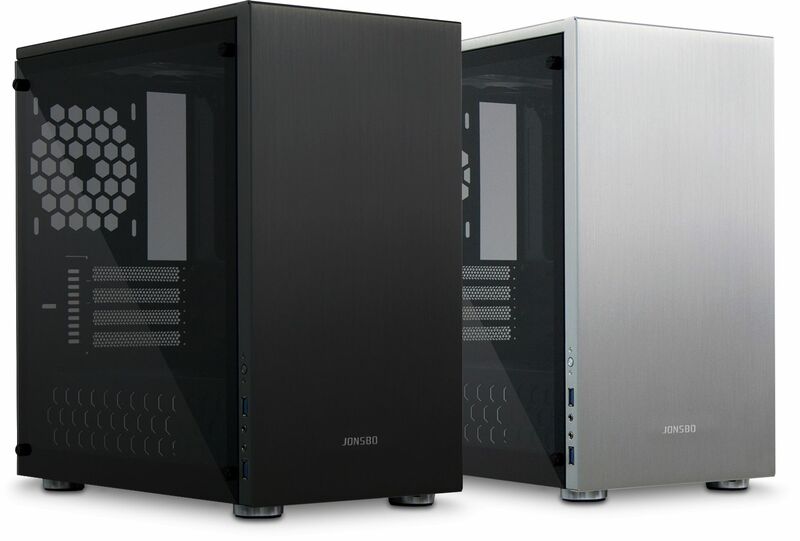 The C3 Plus is supplied with a single 140mm case fan located at the top of the chassis. There are a number of additional fan mounting positions at the front, right and bottom of the chassis to help increase airflow if required. The intentionally simple design of the C3 Plus blends perfectly with any environment. The I/O panel with power button and 2x USB 3.0 is inconspicuously integrated on the front left side of the front panel, giving the front of the chassis a very clean sophisticated look. Behind the front panel is a specially designed mounting frame for two 3.5" drives. This can be removed for easy installation of the drives after loosening a few screws. You can choose to install two 2.5" or a single 3.5" drive on top of the power supply cover. At the bottom of the case there is a mounting space for a 3.5" HDD. Finally, there is space for mounting a 2.5" drive behind the motherboard tray. This high-quality and well-engineered micro-ATX chassis supports motherboards up to a maximum size of 245 x 245mm. The C3 Plus offers space for standard ATX power supplies and has a total of four expansion slots. The tidy interior of the C3 Plus can be equipped with long VGA cards up to 280mm in length (340mm with the mounting frame mentioned above removed). CPU coolers up to a height of 170mm are also supported. The ventilation system of the C3 Plus offers a variety of mounting locations for fans to ensure outstanding ventilation. A quiet running 140mm fan is already preinstalled at the top of the chassis. A further 120mm fans can be mounted at the rear of the housing and another 120mm fan can be installed on the power supply cover inside the case. Finally, instead of mounting two 3.5" drives on the mounting frame, two 120mm fans can be installed to further increase the air intake. There is 35mm of space between the front and the frame, which makes it possible to install the fans or even a radiator of a compact water cooling system. The C3 Plus is aimed at users who are looking for an attractive PC for typical living room applications or even a sophisticated gaming system. As previously mentioned, the intelligent design allows installation of CPU coolers with a maximum height of 170mm. Therefore allowing for very powerful tower CPU coolers installed in the chassis. Combined with space for up to four expansion cards and a powerful graphics cards, the C3 can be used to install a compact yet potent system. Drive bays 4x 3.5" and 1x 2.5" or 3x 3.5" and 3x 2.5"